Jed Cooper: I'm gonna have to carry ya, huh? Big Clint's first film outside of Serigo Leone's sensational Dollars trilogy is none other than...a Western. 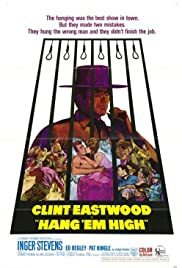 Hang 'Em High is a rather overlooked entry in Clint's long and impressive film wagon, even though it is a serious, no-nonsense and modest look at crime and punishment and a subtle dig at the injustice system, which was somewhat forgotten by his critics who emphasized that he was a symbol of violence, especially in the Dollars trilogy and the Dirty Harry series. Clint plays an ex-lawman who picks up a new badge after he is almost killed by a group of men who hang him and leave him for dead. He then embarks on a mission to hunt them down one-by-one and hand them over to the law. Ted Post's watchable Western drama is definitely a refreshing break from most other 'revenge' movies. Instead of cold-blooded vengeance, the script decides to display Clint's character, though still as the cold, silent anti-hero, as a more peaceful person who would truly like to see men behind bars rather than shooting them down. The film also keeps it grip, rarely letting a boring moment crawl in even though this is more talk than action. Its not a perfect, polished or particularly great film - the characterization always stays pretty low and the romance between Clint and the charming Inger Stevens isn't fully developed, for instance. However, it has its highlights - a memorable opening sequence and an effective musical score - along with its notable touch for seeing justice rather than violence and killing. A good effort that's worth watching and not ignoring.